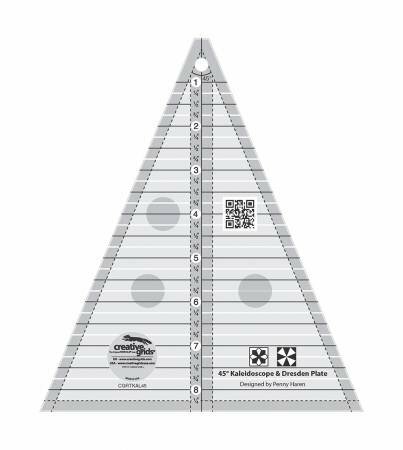 Use this 45 degree Kaleidoscope ruler to cut designs created with eight separate 45 degree triangle units such as kaleidoscopes and Dresden Plate blocks. These triangles can also be pieced into a saw tooth border. Cut triangles to finished height of 8" to piece blocks that measure up to a finished size of 16". A 1/4" dashed line is printed on each side of the center vertical line so you can cut 22 1/2 degree triangles that include the seam allowance.